Ever since the SP brand took hold back in the mid 1990s, many collectors have adopted SP Authentic as their favorite product of the card year. 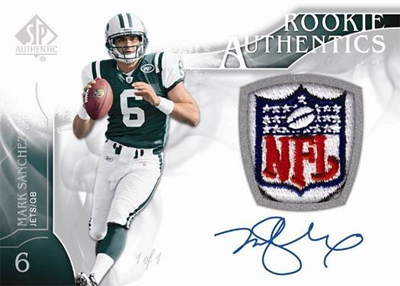 It has given us some of the most valuable football cards in history; from Peyton Manning’s future watch in 1998 to Tom Brady’s rookie in 2000, SP Authentic has never failed to deliver on its mission. Each year it promises extremely valuable cards, quality designs and amazing content, all for a very inexpensive price. It has continued to captivate our interests since the beginning. My favorite part of the set, the SP Rookie Authentics Patch Autos, have always surprised me with their simple beauty. 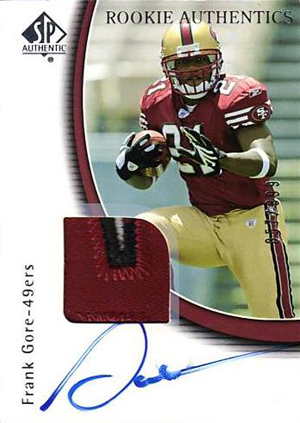 From the looks of the previews (check them out on Upper Deck’s Facebook page), it’s another touchdown for the brand. Even though SP Authentic is one of the most complex sets released each year, the Rookie Authentics are always my number one target. Since 2001, when the first Rookie Authentics style card was put into the set, these cards have been some of the most valuable and popular each year. Michael Vick and LaDanian Tomlinson set the ball in motion that time, which will continue this year with Matthew Stafford, Mark Sanchez and the rest of the 2009 class. Here is a look back at each of the cards since 2001, as well as what they have meant to SP Authentic over the years. 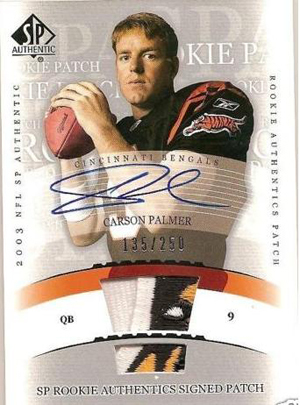 Back in 2001, having a rookie memorabilia card was an absurd idea to many collectors. With the future watch cards, it came to life with a stunning design that has never left the minds of the people who own them. 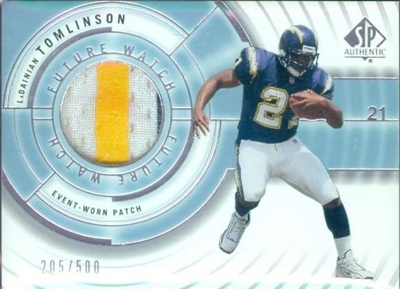 LaDanian Tomlinson’s card, Michael Vick’s autographed card, and a few of the others continue to carry huge value in the hobby. For example, Vick’s card still fetched hundreds of dollars even after his departure from the league two years ago. They were low numbered, amazingly put together, and featured something that had never been done before: a piece of the rookie himself. In 2008, SP Authentic brought back this design for players who didn’t have the chance to be featured, thus completing one of the most epic concepts in the history of sports cards. Renamed for 2002, the Rookie Authentics were created to feature more of the players present at the new annual Rookie Premiere. The concept was similar to the cards from 2001, but featured bigger patches and more autographed versions of the cards. These also featured more cards with parallel versions, providing more value to the collectors who sought them. These cards set the precedent for today’s rookie authentics, cementing the future of the brand for years to come. For the 2003 edition, more autos were featured for the top players. For the first time, cards featured players with their helmets off, in non-game poses. The die-cut windows were also a first, this time right in the center of the picture instead of in the corner. Numbering of these cards shrunk as the amount of players grew, making these cards extremely hard to find. More players were also added to the Premiere’s guest list, thus making the Rookie Authentics the focus of the product for the first time. When 2004 rolled around, the collectors knew an extremely talented class was going to be joining the ranks of the NFL. They were also very excited to see that ALL of the 2004 Rookie Authentics were autographed this time around, setting the standard for later years. Now that an autograph had been added for every one of the cards, the set became one of the most collected in history, as well as one of the most valuable. Even as recent as yesterday, posts on blogs and message boards have been starting up declaring the sheer “awesomeness” of these cards. I am in total agreement. Now heralded as the best cards of the year, the Rookie Authentics of 2005 had large shoes to fill after the previous rookie class’ cards. Since the rookie premiere had expanded into one of the must see events of the year, Upper Deck now had a record number of subjects to incorporate. Even though the rookies didn’t have the bang that 2004 had brought to the table, the design did not provide any disappointment. This was also the first year that 1-of-1 NFL Logo patches were instituted into the product, creating some of the most ridiculously nice cards ever produced. Now that the Rookie Authentics had become some of the most popular cards of they year, adding more chase elements to the set was icing on the cake. When you look up the word “hype” in the dictionary, there is a photo of the 2006 rookie class. On the winds of this humongous storm, 2006 SP Authentic and 2006 Exquisite were talked about as having the potential to be the most valuable cards ever produced. For a while they were, and even still command top dollar more than three years later. Even though some setbacks have befallen the rookies of that year, the cards remain extremely popular due to their simple design, and “in your face” style player photos. With the standard set structure of Base, Gold, and Platinum 1-of-1, this product built on the foundation provided by the 2005 set. Also, in a time where almost every company had switched to label signatures, the 2006 set remained completely hard signed, a feat that many had deemed impossible. Like the previous class, 2007 brought lots of potential into the season. So appropriately, the cards also brought many amazing things that year. Switching to a horizontal orientation for the first time ever, as well as a stark white and team color presentation, these cards were collector favorites. The 2007 offering also featured two player pictures for the first time: one with a game style picture, and one featuring a portrait. 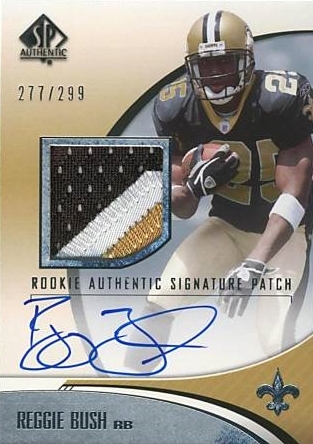 As players like Adrian Peterson tore it up on the field, this set burst onto the scene, setting records as some of the most valuable versions of the Rookie Authentics since 2001. Continuing with the horizontal orientation of 2007, the 2008 cards promised to deliver everything that previous years had and more. There were more per case, helping more collectors have access to their favorite rookie cards of the year. Simplicity was the name of the game with 2008’s set, and the adage “less is more” was great to show just how amazing these cards were. For the 2009 preview, we can see the evolution of the brand in practice. Horizontal orientation from previous years is used again, as well as the team color elements of 2007, and the game style photos of 2005. The eerie smoke that encompasses the players serves as the theme of the product, maybe to signal how hot these cards will be. Overall, it’s become pretty clear why each version of the SP Authentic rookie cards is so popular. The product is always on the cutting edge of design and innovation (and being extremely valuable doesn’t hurt), but popularity doesn’t rest in those factors alone. It has to do with everything that came before, building to the latest crescendo we will see for this year (as always). I know I will be at the shop on the day of release just like every year, and as usual, I’m expecting a lot of people to be there with me. Always have loved these cards, only wish I could afford cases of this stuff! Keep up the Great Cards! I can’t wait to put the set together again this year! !